What is Bee Pollen Complex? Pollen is the male seed of flowers. It is required for the fertilization of the plant. The tiny particles consist of 50/1,000-millimeter corpuscles, formed at the free end of the stamen in the heart of the blossom. Every variety of flower in the universe puts forth a dusting of pollen. Many orchard fruits and agricultural food crops do, too. When bees collect nectar for honey, they coat their legs with pollen. The pollen is collected when they pass through a screen while returning to the hive. The screen gently scrapes the pollen off their legs where it drops into a tray for collection. 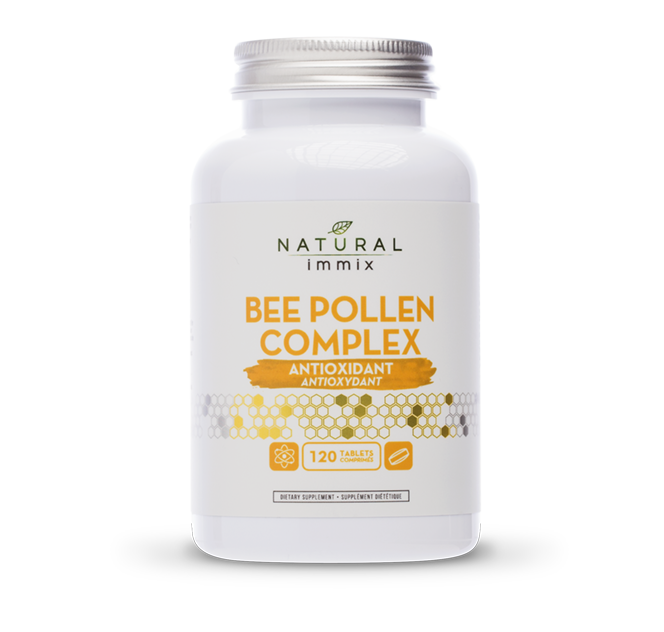 Bee Pollen Complex is a natural source of naturally-occurring vitamins, minerals and enzymes that help improve mental and physical performance. It combines Bee Pollen with standardized extracts of Bee Propolis and Royal Jelly to enhance immunity, fight infection and alleviate the symptoms of stress. 100% lab tested, Bee Pollen Complex tablets are used to boost energy levels, stimulate the immune system, reduce stress and support the maintenance of everyday, good health. Bee Pollen:  is the food of the young bee and contains approximately 25-40% protein, although it is considered a low-calorie ingredient with only 45 calories per tablespoon. It is considered one of nature's most completely nourishing foods as it contains nearly all nutrients required by humans. About half of its protein is in the form of free amino acids that are ready to be used directly by the body. Additionally, Bee Pollen contains more than a dozen vitamins, 28 minerals, 11 enzymes, coenzymes, and 14 fatty acids. Bee Propolis: is the strongest antibiotic found in nature. Unlike many antibiotics, Bee Propolis is exceedingly safe and does not destroy good, beneficial bacteria along with bad bacteria and has no known side effects, contraindications or upper limits of ingestion. Bee Propolis does not cause the body to build up a tolerance over time, meaning it can be used regularly without losing effectiveness. Bee Propolis has captured the attention of those wanting to enhance their overall, general health because it contains many nutrients such as protein and amino acids, trace minerals - magnesium, calcium, phosphorus and potassium - plus antioxidants such as beta carotene and bioflavoniods, as well as vitamins B1 and B2. Royal Jelly: is a very rich source of proteins and contains eight essential amino acids, important fatty acids, sugars, sterols and phosphorous compounds as well as acetylcholine, which is needed to transmit nerve messages from cell to cell. It contains gamma globulin, known to stimulate the immune system and fight off infections. Royal jelly contains naturally occurring vitamins A, B, C, D and E. It is particularly useful for its B-complex contents, including B1, B2, B6, B12, biotin, folic acid, and inositol. Royal jelly is also high in the B vitamin pantothenic acid, recognized for its ability to reduce stress levels. Additionally, it supplies the minerals, calcium, copper, iron, phosphorous, potassium, silicon and sulfur.